The Arrive Alive Creative Contest is open to graduating high school seniors throughout the state of Maine. Seniors may enter by submitting a creative project of their choice that sends a message to their peers about the dangers of drinking and driving and/or the dangers of distracted driving. First-place winners in the Arrive Alive Creative Contest receive a new laptop computer, second and third-place winners receive a new iPad, and everyone who enters the contest wins fun prizes from the Law Offices of Joe Bornstein. Go On!! – Here’s Your Chance – Be Creative!! Graduating seniors may enter any kind of creative project that warns of the dangers of drinking and driving and/or distracted driving. Past entries have included essays, poems, paintings, public service announcements, videos, recorded songs, t-shirts, board games, drawings and more. The more creative, the better!! Essays should be no longer than 1,000 words, videos and songs no longer than five minutes, and all artwork must be easily transportable. Students may submit more than one entry and work together in teams, however, only one prize will be awarded per winning entry. The deadline for entries is Friday, May 10, 2019. Entries may be submitted online, sent via mail, or dropped off at one of our seven office locations in Sanford, Biddeford, Portland, Windham, Lewiston, Augusta, and Bangor. If dropping off an entry in person, please call ahead to schedule a convenient time to do so. Entries that are submitted in person or via mail must be accompanied with an Entry Form. Winners will be notified by mail approximately two weeks after the contest closes. If you have any questions please email: arrivealive@joebornstein.com or call 1-800-CALL-JOE (1-800-225-5563). 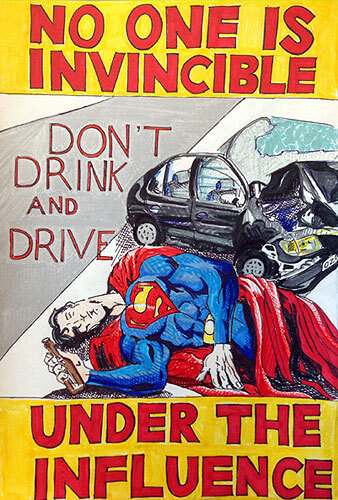 Submission of an entry to the Arrive Alive Creative Contest constitutes permission for the Law Offices of Joe Bornstein to use the entrant’s name, likeness, biographical information, information and materials contained in the entry form or online submission, and photographs in advertising and promotion without further compensation or permission, except to the extent prohibited by law. All entries, and any copyrights and/or other intellectual property rights therein, become the sole property of the Law Offices of Joe Bornstein. Entrants represent and warrant that their entry is their original work and does not infringe upon or violate the intellectual property rights or other rights of any third party, and grant to the Law Offices of Joe Bornstein the right to edit, publish, promote, and otherwise use their entry materials without permission, notice or compensation of any sort. By submitting an entry to the Arrive Alive Creative Contest, each participant (and parent or guardian) assigns all right, title, and interest in and to the entry to the Law Offices of Joe Bornstein and represents and warrants that the participant (and parent or guardian) have the authority to assign such right, title, and interest. To the extent requested by the Law Offices of Joe Bornstein, each participant (and parent or guardian) agrees to execute a separate assignment instrument and/or other documents deemed necessary by the Law Offices of Joe Bornstein to secure the rights assigned herein. Each entrant (and parent or guardian) agrees to release and hold harmless the Law Offices of Joe Bornstein, and its employees, officers, directors, shareholders, agents, and representatives from any and all damages, losses, claims and liabilities arising out of entry or participation in the Arrive Alive Creative Contest or resulting from acceptance or claiming of any prize hereunder. The Law Offices of Joe Bornstein reserves the right, in its sole discretion, to terminate, suspend or otherwise cancel the Arrive Alive Creative Contest at any time. Income and all other taxes are the responsibility of the prize recipient. The Law Offices of Joe Bornstein is not responsible for any costs or expenses incurred by entrants in connection with their entry or participation in the Arrive Alive Creative Contest. Joe Bornstein®, The Lawyer You Need to Know®, 1-800-CALL-JOE®, Maine Lawyers Working for Maine People® and, The greatest compliment a client can give us is the referral of a loved one or friend. Thank you for your trust in us.® are all federally registered trademarks of The Law Offices of Joseph L. Bornstein. Copyright © 2018 The Law Offices of Joseph L. Bornstein. All rights reserved.